Many helpful books are prohibitively expensive, so you may want to check them out of the library, if possible. I found these from amazon.com interesting. Remember, if you're an iGive member, many places online will donate a percentage of the cost to the running and maintenance of these Cushing's sites - at no cost to you. At this time, Amazon in no longer one of those. Read more about the iGive program. If you know of any good books that I've left out from this list, please let me know. Proceedings of the Fourth European Workshop on Pituitary Adenomas held Sept. 1987, Zurich, Switzerland. Includes papers by participants from a variety of disciplines: anatomy, physiology, pathology, pharmacology, endocrinology, neurosurgery, gynecology, and radiology. Most papers focus on new developments in the fields of diagnosis and medical treatment, including the results of long-term follow-up of surgically treated patients; however, topics involve all aspects of pituitary adenomas, both at the clinical and at the laboratory levels. Covers pathology, endocrinology and physiology, diagnostic radiology, acromegaly, prolactinomas, Cushing's disease, glycoprotein hormone secreting and endocrine inactive adenomas, and vascular and immune disorders. Annotation copyright Book News, Inc. Portland, Or. Contemporary Diagnosis and Management of Pituitary Adenomas (Neurosurgical Topics Series) by Paul R. Cooper Park Ridge, Illinois: American Association of Neurological Surgeons, 1991. Current Diagnosis, No. 8, by R.B. Conn, T. Gomez, G.P. Chrousos, Philadelphia: W.B. Saunders 1991, 868-872. Cushing's Syndrome provides the reader with an update on the clinical presentation, diagnosis, and treatment of patients with Cushing's syndrome. Molecular mechanisms of pituitary and adrenal causes of Cushing's syndrome are reviewed in detail. Successful diagnostic and treatment strategies that have been employed by readers in the field are recommended and discussed. Numerous advances in the pathophysiology and diagnosis of Cushing's syndrome speak to the timeliness of this volume that has been penned by experts in the field. Cushing's Syndrome Etiology, Harrison's Principles of Internal Medicine. Vol. 2, No. 13, by Kurt J. Isselbacher, ed., et al. New York: McGraw-Hill Book Company, 1994. 1960-1965. We all face hard times at one point in our lives. But the times when we question our faith, and question our ability to move on are especially important. Do we trust in God? Do we trust in ourselves? Something as bad as a fatal illness can cause fear, doubt, and questions about what you are doing on this earth. Pain takes over and renders us helpless and willing to throw in the towel and give up. But God tells us that He will sustain us. He will lift us up. Art Russell shares the powerful story of his struggle with Cushing's Disease. Although unfamiliar to most people, Cushing's is a potentially fatal disease that strips the victim's life away piece by piece. As you read, you will get an up close and personal look into the life of someone plagued with Cushing's disease and his daily struggles. Discover Scriptural passages he surrounded himself with. Read his honest, open cries to God and discover how in the midst of pain and uncertainty, he fights to keep his faith strong and find rest in God. Nineteen review articles illuminate the basic mechanisms of normal and abnormal pituitary processes and present the newest approaches to diagnosing and treating patients. Topics range from normal hypothalamic-pituitary interactions and the processes that disrupt them to new advances in pituitary imaging and appropriate surgical intervention in various pituitary disorders. Among the diseases discussed are congenital hypopituitarism, deficiency states, strategies for evaluating patients with hyper prolactinemia, Cushing's syndrome, acromegaly, and glycoprotein pituitary tumors. Book Description Hormonal Balance profiles each hormone system in clear terms, discussing what can go wrong and how imbalances can affect weight and even perpetuate obesity. By explaining how to reverse symptoms of hormonal imbalance through diet changes and other remedies, readers learn to recognize and respond to hormone imbalances in everything from menstrual cycles to diabetes. Dr. Isaacs is Melinda Freels' Endo. Melinda writes: "I want to give my endo's new book a plug. He doesn't know I'm doing this. Dr. Isaacs is the best endo I've seen, (and I've seen at least a dozen in the Atlanta area) plus he really knows his stuff. Anyway, Hormonal Balance is very well written, in easy-to-understand language. It covers a variety of hormonal diseases, including Cushing's, PCOS, Androgen disorders, insulin resistance, thyroid, growth hormone deficiency, etc. Hyperfunction: Glucocorticoids: Hypercortisolism (Cushing's syndrome), Williams Textbook of Endocrinology, No. 8 by Jean D. Wilson, ed, et al. Philadelphia: W.B. Saunders, 1992; 536-562. Donna Renfro, the author, is inviting you to take a journey of the heart with her. She was told her daughter would die. Donna refused to quit. This book is accumulation of faith and endurance beyond human strength. Donna began writing the book in the year 2000. She wrote it in sheer desperation, believing without any natural hope that her daughter Miranda would get a miracle. 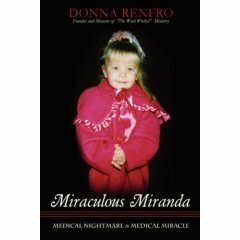 Seven years and many battles later, the book is complete with Miranda's miracle! You can read part of this book online at this link. Linda is a member of the Message Boards. 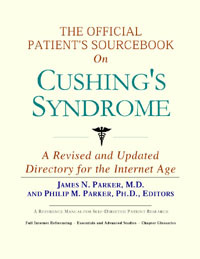 A comprehensive manual for anyone interested in self-directed research on Cushing's Syndrome. Fully referenced with ample Internet listings and glossary. This sourcebook has been created for patients who have decided to make education and Internet-based research an integral part of the treatment process. Although it gives information useful to doctors, caregivers and other health professionals, it also tells patients where and how to look for information covering virtually all topics related to Cushing's Syndrome, from the essentials to the most advanced areas of research. The title of this book includes the word official. This reflects the fact that the sourcebook draws from public, academic, government, and peer-reviewed research. Selected readings from various agencies are reproduced to give you some of the latest official information available to date on Cushing's Syndrome. Following an introductory chapter, the sourcebook is organized into three parts. PART III. APPENDICES; Appendix A. Researching Your Medications; Appendix B. Researching Alternative Medicine; Appendix C. Researching Nutrition; Appendix D. Finding Medical Libraries; Appendix E. Your Rights and Insurance; ONLINE GLOSSARIES; CUSHING'S SYNDROME GLOSSARY; INDEX. Related topics include: Adrenal Cortex Adenoma, Adrenal Hyperfunction resulting from Pituitary ACTH Excess, Cushing's III, Ectopic ACTH Syndrome, Ectopic Adrenocorticotropic Hormone Syndrome. Book Info Univ. of California, Los Angeles. Comprehensive reference for students, residents, and clinicians. Devoted to the understanding of pathogenesis and treatment of pituitary disorders. Reflects recent advances in molecular biology, biochemistry, and therapeutics as they apply to the pituitary gland. Blends basic science and clinical medicine. Previous edition: c1995. DNLM: Pituitary Diseases. Pituitary Patient Resource Guide, 3rd Edition The 3rd Edition of the Pituitary Patient Resource Guide is finally here! For those who are unfamiliar with the first two editions of the Resource Guide, you will find this book a very welcome relief in your struggle for greater understanding of your own condition, as well as the options and treatments open to you. There is simply no such gathering of information for pituitary patients anywhere else in the world, in any form. This book is packed with articles (63) on a wide range of issues faced by pituitary patients, as well as listings of hospitals, medical centers, and physicians that specialize in the treatment of pituitary disorders and additional resources and organizations around the world, and on the Internet. 100 pages larger than the 2nd edition, and for the first time in this edition, we have included a huge new section, the Pituitary Patient Tool Kit. Additional resources like Internet links and other helpful organizations. Pituitary Patient Resource Guide by Shereen Ezzat (Editor) It is with great pleasure that we bring you the second edition of the Pituitary Patient Resource Guide, the world's only reference guide for pituitary patients, their families, their physicians, and all health care providers. Better, bigger (50% bigger! ), and more complete than ever before, it is our answer to your calls, letters, and demands for more information, deeper knowledge, and better explanations! For those who are unfamiliar with the first edition of the Resource Guide, you will find this book a very welcome relief in your struggle for greater understanding of your own condition, as well as the options and treatments open to you. There is simply no such gathering of information for pituitary patients anywhere else in the world, in any form. 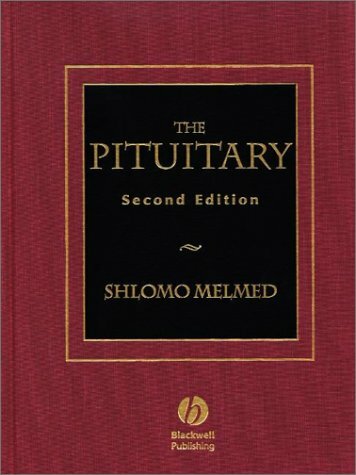 This book is packed with articles on a wide range of issues faced by pituitary patients, as well as listings of hospitals, medical centers, and physicians that specialize in the treatment of pituitary disorders. The Resource Guide will also help you find the appropriate doctor for you, and additional resources and organizations around the world, and on the Internet. This book is the best launching pad you can have in your struggle. Much has happened since the first edition of the Resource Guide in 1995. New medicines have been approved, and new methods and modalities have been tried and implemented (or discarded). The medical and patient-care communities and insurance companies/HMOs are under attack regarding cost and government regulations as never before, and not just in the United States. But as is always the case, we the patients are paying for it in more ways than one. Patients are denied services and medicines in many countries because it is just not "cost effective". However, we know this with certainty; more pituitary patients are being discovered earlier and treated better than ever before. By using the Resource Guide, our newsletter, and our Web site at www.pituitary.com, they are being listened to and taken seriously by their physicians and their HMO's - and hopefully - their governments. For the first time, in this edition, we are introducing articles by physicians and patients alike, driving home the points we have made for years; that emotional and sexual aspects of pituitary disease need and deserve more attention! These subjects have been virtually neglected since they were first described by Dr. Harvey Cushing, the teaching pioneer in pituitary disease. We have elected to place these issues squarely in the middle of the table for all to see. Author's description This is the author's account about dealing with a rare and life-threatening disease and her fight with a doctor who wouldn't believe or help her. "This is my true story about dealing with a rare and life-threatening disease and my fight with a doctor who wouldn't believe me and wouldn't help me. If you feel strongly about something, tell your doctor. If he/she doesn't want to listen, tell another. Keep going until you find the one who WILL listen! After all.... no one knows your body better than you! I'm thankful that I am still hear to share my story. I sincerely hope you will enjoy it and if I have helped only one person to NOT give up...than I feel that I have accomplished everything!